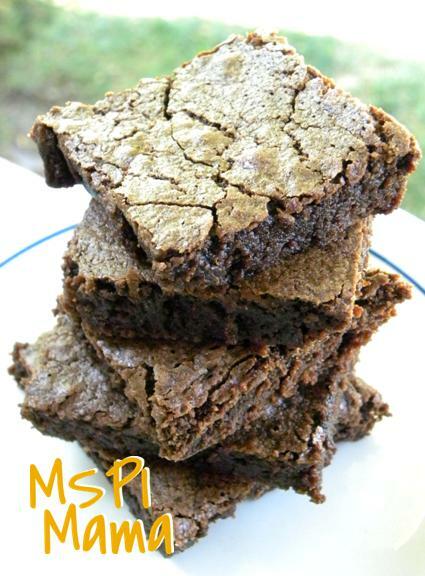 MSPI Mama: The all new MSPI Mama ... and a brownie, too! Recipe Index: I've finally compiled a full list of all my recipes (more than 300 of them!) and organized them according to type of recipe. Hopefully, this will help you in your menu planning and make it easier to find recipes. Web Resources: I've compiled a list of websites that have been helpful to me over the years. I've even included links to restaurants' allergen and ingredient information! Grab a Button: For those of you who have a blog of your own, let the world know you're a proud MSPI Mama by adding my button to your site. If you do, drop me a line letting me know, including a link to your blog, and I'll link back to your site! Link Love! Quick Start: Check out my full list of Quick Start recipes! And speaking of Quick Start, this brownie recipe is super-duper easy (almost as easy as a mix!) and completely free of dairy and soy. Perfect for Quick Start. What better way to celebrate the redesign than chocolate! Enjoy the site. I hope you like it! Preheat oven to 350 degrees. Grease a 9x9-inch baking pan. In a medium bowl, mix together the oil, sugar and vanilla. Beat in the eggs. Combine flour, cocoa, baking powder and salt; gradually stir into the egg mixture until well blended. Spread the batter evenly into the prepared pan. Bake pan for 20 to 25 minutes, or until the brownies begin to pull away from the edges of the pan. Let cool completely on a wire rack then place in refrigerator to cool down even more. The brownies are best when they've had time to cool and develop their flavor! Quick Start with MSPI Mama: This is one of my Quick Start recipes. These are freaking amazing. I make them at least once a week. Thank you so much for sharing so that I can feel like I still get treats even though I can't have dairy/soy. Some of the best brownies I have ever had!! Thanks so much! I also have a strange question about recipes that call for milk... Is it okay to use breast milk in place of cows milk? I have never used breast milk in recipes before, so I have no idea! Maybe try Googling it to see what you find? How could you replace the eggs in this? I am also egg free and often use fruit (banana, apple,), pumpkin or flaxseed but not sure how it would work with brownies. Owl's Nest, here's a great resource about replacing eggs in baking: http://chefinyou.com/egg-substitutes-cooking/. Hello~ I was wondering what brand did you use for cocoa powder? I am unable to find one that is dairy and soy free. Thanks! Natural, unsweetened cocoa powder should have nothing but ground cocoa beans in it. Unless there's cross-contamination in the production process, most cocoa powders should be fine. Do not confuse it with hot cocoa powder, however, that you use for hot chocolate! You want the cocoa powder found in the baking aisle. Popular brands include Hershey's, Ghiradelli and Toll House -- however, I haven't looked at any of those labels in a while, so read them carefully. We are enjoying these brownies at our house! I make them in muffin tins with liners for a grab-and-go and serving-size sweet treat! Love, love, love!!! Made them three times in my first month on this diet. I shared them with others and the pan disappears in a day every time. Do you need to keep these refrigerated? Thanks! Thank you! My niece was recently diagnosed with milk and nut allergies, so I thought I would make this for her. They smell delicious and can't wait to dig in! Either way will work. You'll just have to stir longer by hand than you would with a mixer. Good luck ! What do y'all use to grease pans? I have always buttered and floured my pans. Still have not found a butter substitute. Coconut oil should do the trick. Hello! I made some but the brownies are coming very cakey. Am I over mixing? Overmixing is definitely a likely culprit.